To boil sugar is one of the niceties of cooking, but as the uses of boiled sugar in fancy cooking are so various, it is worth some practice to acquire the requisite skill. With the ordinary ways of testing, it requires much experience to tell the exact point at which to arrest the cooking, and on this the success depends. The stages named "thread," "blow," "ball," etc., give the different degrees required for different purposes. It passes quickly from one to the other and needs careful watching and close attention. The professional cook's method of testing it by dipping in the fingers is not practicable for ordinary use. It is also difficult to judge by dropping it in water unless experienced, but with a sugar thermometer it can easily be determined with perfect exactness and much less trouble. 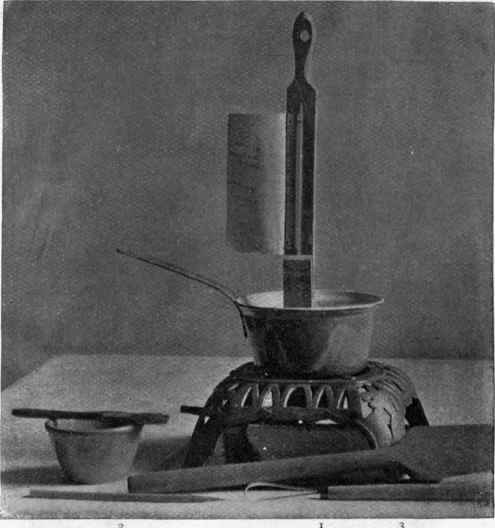 A sugar thermometer costs $1.75 or $2.00, a syrup gauge costs fifty cents, and both should be considered as necessary cooking utensils as are molds, mortars, and other articles used in fancy cooking. For measuring syrups, the syrup gauge is used as explained below. Ice-creams and frozen fruits are much nicer when sweetened with syrup instead of sugar. Water-ices and compotes to be right must measure a certain density, and for this the syrup gauge is employed. 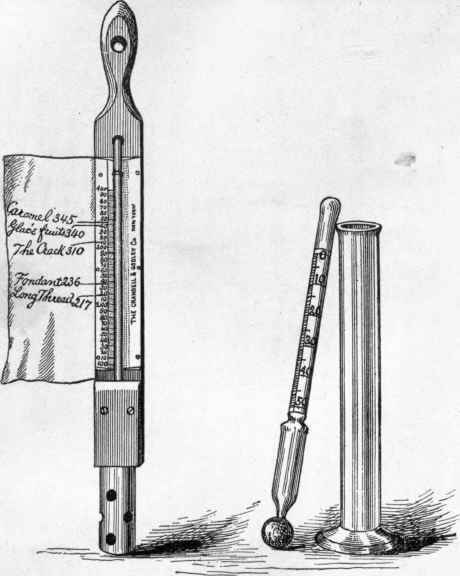 SUGAR THERMOMETER AND SYRUP GAUGE. (SEE PAGE 510). 1. Thermometer standing in saucepan of sugar on gas-stove. 2. Cup of water and brush for washing crystals from side of saucepan. 3. Wooden spatula for working sugar on marble slab to make fondant. i. Wooden skewer for testing sugar when thermometer is not used. 5. Candy wire for dipping nuts or other things to be coated. Fondant, one of the very useful articles, candies, and spun sugar are easily made with the aid of the thermometer. Eleven stages of sugar are explained below, but it is not essential to learn exactly more than the four which are most used, namely: the "thread" for boiled icing, the "soft-ball" for fondant, the "crack" for glace fruit, and the "caramel". The tendency of sugar, when the water which holds it in solution is evaporated, is to resume its original form of crystals; to prevent this is the chief care: the liquid must not be jarred or stirred after the sugar is dissolved. The grains which form on the sides of the pan as the boiling proceeds must be wiped away; this is done by dipping a cloth or brush into water and passing it around the pan above the sugar. If these crystals are allowed to remain, the whole mass will become granular. Also the sugar has a great affinity for water, and care must be used to have a dry atmosphere. No steam from boiling kettles, etc., must be in the room, and it is useless to attempt confections requiring the ball or crack stages on a rainy or damp day. When the right degree is reached, place the sugar pan in one containing cold water, to prevent the cooking from proceeding any farther. The different stages follow very quickly after the thread; it is therefore well to have a moderate heat and give it undivided attention. A very little cream of tartar (a scant half saltspoonful to a pound of sugar) added at the' beginning makes the sugar less liable to grain. If cream of tartar is not used, a few drops of lemon-juice should be added at the crack stage. If the sugar passes the degree desired, add a spoonful of water and continue the boiling. No sugar need ever be wasted unless it becomes burned. In working the sugar, if it begins to grain there is nothing to do but to add a little water and boil it again.